This week’s post is a guest post by Shir Halpern, food writer and founder of the Tel Aviv Farmers Market. One evening at an event in the Farmers Market, Danya and Deanna invited me to do a guest post on their blog, and I immediately said “Yes”! I met Danya some years ago while working at the Israeli culinary magazine, “Al Hashulchan”. I was cooking and she was photographing, and we found many common passions for food, styling, design, dishes, knives (cooking of course) and food magazines. Any chance I get to have the food I make photographed professionally I jump at; it brings out the visual, creative side in me and allows me to “play with the food”- to think not only about the flavors of the food but also the colors, texture and feeling. Doing this with Danya and Deanna is about as good as it gets- it was an honor for me to cook and for them to do their thing. Even better was that when I got to the studio, they had just finished shooting the cinnamon pull apart bread– and gave me some to take home. 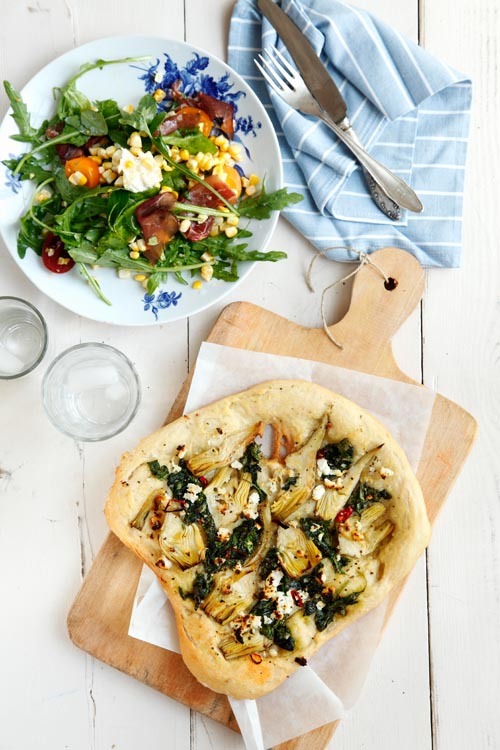 These recipes were inspired by the summer, with local, seasonal, fresh produce. Despite the amazing fruit you can find in the market these days, I decided to make recipes for a light dinner. These two recipes are simple to make and are really refreshing. The baby spinach leaves work great both in the salad and on the focaccia, where they are sautéed for a minute with butter and ready to eat. 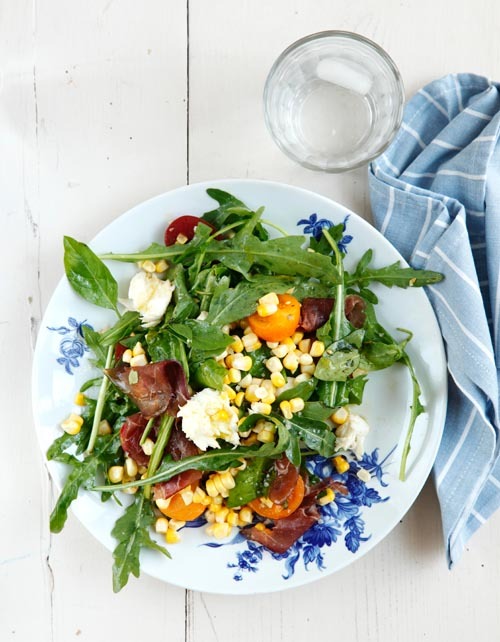 The sweet corn in the salad is tasty enough and fresh enough to eat “raw”, without cooking it ahead of time. Both of the cheeses I used here- the fresh ricotta and mozzarella are both light and airy, and are great for summertime meals. I used canned marinated Italian artichokes for the focaccia, a nice short cut when you don’t want to spend all your time cooking- but more time enjoying. Make the dough: in a small bowl, mix together the yeast, water and honey and set aside. In a separate large bowl, mix together the flour and salt and make a well in the center. Pour the yeast mixture into the well, add the olive oil and mix with a wooden spoon until all ingredients are combined. The dough will be sticky. Cover with a damp kitchen cloth and allow to rise until doubled in size, for about 35-45 minutes. Punch the dough, cover and allow to rise for an additional 30 minutes. At this point, the dough can be stored in the refrigerator and used within 24 hours. Prepare the topping: heat the butter in a skillet over medium heat and add the spinach leaves. Sauté for 2 minutes, season with salt and pepper and remove from heat. Divide the dough into two equal parts. Roll out one piece of the dough onto a baking pan lined with parchment paper. 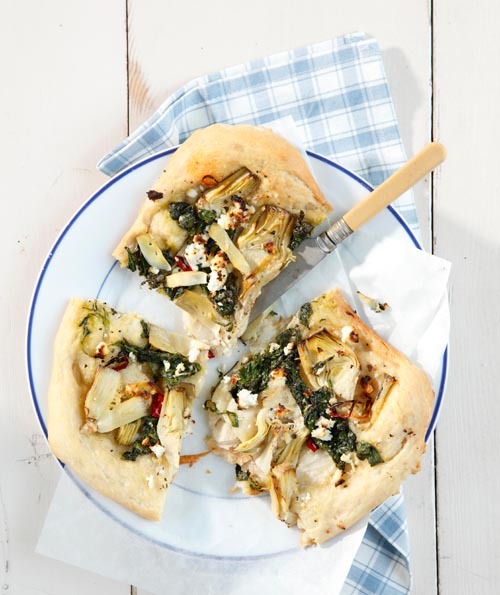 Top with cooked spinach, artichokes, ricotta, chili and basil. Sprinkle on coarse sea salt, fresh ground pepper and a drizzle of olive oil. Repeat with second piece of dough. Lower heat to 400ºF. Bake focaccia for 20 minutes, until golden. In a large bowl, mix together all the ingredients for the salad. In a separate bowl, whisk together all the ingredients for the dressing until smooth. Hey would you mind sharing which blog platform you’re using? I’m planning to start my own blog soon but I’m having a tough time making a decision between BlogEngine/Wordpress/B2evolution and Drupal. The reason I ask is because your design and style seems different then most blogs and I’m looking for something completely unique. P.S My apologies for being off-topic but I had to ask! Hey there admin, I absolutely required to firmly give a short mention to actually mention that in fact I appreciated your specific blog post. Thanks! This kind of clever work and exposure! Keep up the terrific works guys I’ve included you guys to my personal blogroll.